It's Monteverde week, so today we are looking at Monteverde Ocean Noir, from the Noir collection of 10 inks. Vanness Pens was very kind to send a sample over for review. 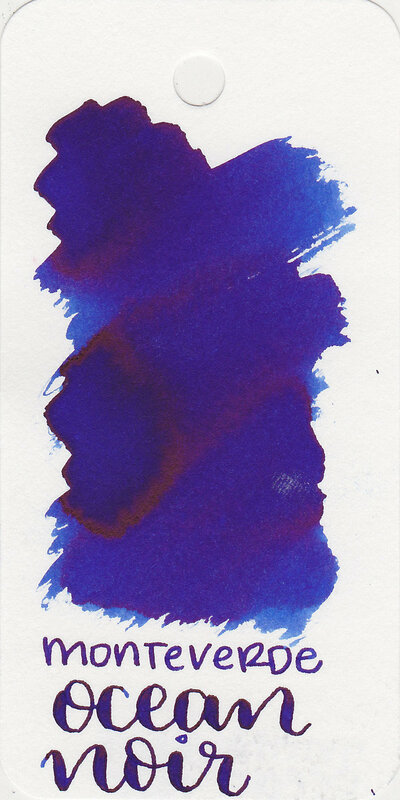 Ocean Noir is a beautiful blue with bright copper sheen. It is very saturated. It was really hard to get the sheen to show up correctly in photos, but it's a bright copper. Bleeding: Low-there was some bleeding in the flex nib, mainly on Tomoe River paper. Other properties: Low shading, high sheen, and no shimmer. I was really impressed by the sheen. It's a bright copper color, showed in every nib size on Tomoe River paper, and was visible in at least one nib size on all of the other papers. Ink swabs for comparison, left to right (top to bottom for mobile RSS): Diamine Tudor Blue, Monteverde Ocean Noir, and Akkerman #5 Shocking Blue. Click here to see the Monteverde inks together. Diamine Oxford Blue, Diamine Majestic Blue, and Organics Studio Emerson. Click here to see the blue inks together. I used a broad Pelikan M805 Vibrant Blue on Tomoe River paper. The ink had a fabulous wet flow. It was really smooth in this pen. Overall, I love the flow of this ink, as well as the bright copper sheen. I plan to buy a 30ml bottle of this ink, because I really like it and it's one of the more affordable brands. Give it a try, you might love it. 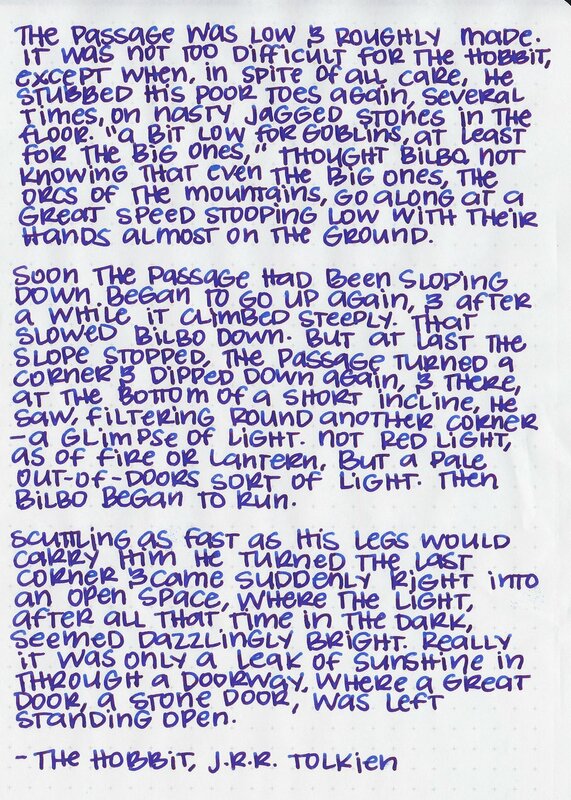 Disclaimer: This ink sample was sent to me by Vanness Pens for the purpose of this review. All photos and opinions are my own. There are no affiliate links on this page.